تُعتبر ليالي لبنان إحدى الحلويات الصيفية المفضلة لدي؛ لسهولة تحضيرها في وقت قصير نسبياً ولطعمها اللذيذ ورائحتها العطرية الأخاذة. تتمازج كل من القشطة والمستكة وماء الورد في صنع هذا الطبق الذي أظن أنه لبناني الأصل ولا أعرف السر وراء اختراعه، ولكن يبدو أنه في إحدى ليالي بيروت الصيفية تفاجأت سيدة بزوار على غفلة ولم تملك سوى مكونات بسيطة فقامت باختراع هذا الطبق. فكرة ليالي لبنان ببساطة: طبقة من السميد المعقود بالحليب تمتد فوقها طبقة من القشطة مزُينة بالفستق الحلبي المفروم ومن ثم يُصب عليها القطر الذهبي. وتوجد طرق عديدة وكثيرة لليالي لبنان؛ فالبعض يستخدم فيها البيض والبعض لا يستخدمه بتاتاً، البعض يستخدم السكر والآخر يستخدم القطر. ولكن لأن ليالي لبنان يُفترض أن تكون “حلو” سهل جداً فأنا لا أفضل استخدام البيض في وصفتي ولا حتى السكر، بل أكتفي بالقطر حتّى يختار كل فرد الحلاوة التي يرغب بها. للحصول على نسخة صحية من ليالي لبنان بالإمكان استخدام العسل بدلاً من القطر أو استخدام حليب منزوع الدسم أو قليل الدسم. لكنني أفضل دائماً استخدام الحليب كامل الدسم في الحلويات العربية بشكل خاص. Lebanese nights or Layali lubnan\Libnan (depends on your accent) is a Middle Eastern dessert that is a great choice for summer; it’s easy to make and you can cook it in a short time. It also has a rich and delicious flavor and a wonderful aromatic smell. From the name you will definitely guess that it’s a Lebanese dessert, but I am not sure why it’s called Lebanese nights; probably a lady in Beirut had some unexpected visitors and had only those ingredients so she decided to create this dish. 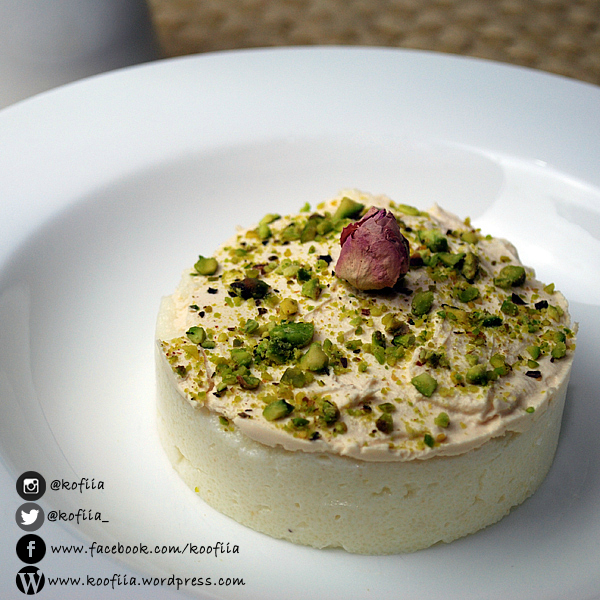 Lebanese nights is actually a semolina budding with cream, pistachio and sugar syrup on top. There are a lot of different recipes for Layali Lubnan, some people use eggs while others don’t. Some people use sugar in the semolina pudding itself while others use sugar syrup. So it’s all up to your taste; however, I don’t tend to use eggs or sugar. I use sugar syrup so everyone can decide how sweet they like the piece eating. If you want a healthier version of layali lubnan you can use honey instead of the sugar syrup and you can use skimmed milk or low fat, but I find full fat milk is what should be used when making Middle Eastern desserts. Mastic and rose water are really important when preparing most of the Middle Eastern desserts. However, if not found you can prepare the recipe with adding vanilla essence instead buف in less amount of course. However, you can find the rose water or the mastic in any Middle Eastern or Iranian shop. 1- One cup of semolina. 2- One liter of full fat milk (you can use skimmed or low fat). 3- 3 Tbsp of rose water. 4- 1/2 tsp of ground mastic. 5- Coarsely ground pistachio (the amount you prefer and it’s optional). 6- Thickened cream (I usually buy the one from the Middle Eastern shop). 1- 1 & 1/2 cup of sugar. 2- 1 cup of water. 3- Juice of quarter lemon. 1- Mix sugar and water in a sauce pan. 2- Bring to boil and add the lemon juice. 3- Reduce heat to low and keep for 10 minutes. Set aside to cool down. You can keep it in the fridge later for almost a month. 1- Mix the semolina and the milk in a cooking pot. Keep stirring very well so the semolina don’t stick to the bottom. 2- Add the Mastic and keep stirring. Once you bring it to boil you can notice that the mixture is thickened and ready. 3- Add the rose water and mix very well so it distributes to the whole semolina pudding. 4- Pour the mixture in 9*13 inch serving dish or in cups and leave it aside to cool down. 5- When it cools down, add a layer of the thickened cream on top. Cover with plastic wrapping paper and refrigerate. 6- Before serving sprinkle with coarsely ground pistachio. Cut into squares if it was in serving dish and pour the amount you desire of the sugar syrup. + لا تصبيها بحيث تكون سميكة جداً. يجب أن تكون رفيعة بعض الشيء. هدول بفرقوا كتير بالطعم. وممكن السميد صحيح.